• Cracked wheat (soaked) - 1 cup. • Bread slices - 4 slice. • Spinach / greens - 1 bunch. • Chick pea flour - 2 teaspoons. • Ginger - 1 tea spoon. • Green chilli (chopped) - 2 teaspoons. • Amchoor powder - ½ tea spoon. • Curry leaves (chopped) - 1 tea spoon. Soak the cracked wheat for 1 hour. Soak the bread one at a time in the water and squeeze out the water. Place along with wheat. Then add chopped spinach, ginger, green chilies, chopped curry leaf, cumin seeds, coriander powder, amchur or chat masala. Add some besan/chickpea for binding and check for salt. Use some water and shape them to Wada's and deep fry them till they become golden. This is simple and easy to make snack recipe. 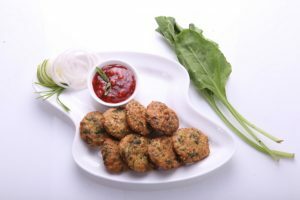 Cracked Wheat Bread Spinach Vada is an awesome combinatio... Read More..